Fast, capable and good at output quality. Isn’t it what you would expect from a HP color laser printer. New HP Color LaserJet CP4005dn Printer is just like that. It has paper capacity of 600 pages (500-sheet drawer and a 100-sheet multipurpose tray), which is enough for the small to medium-size office. Want more? Then there is an optional 500-sheet tray. The printer has duplexer unit for double side printing, and offers 80,000 pages of monthly duty cycle. 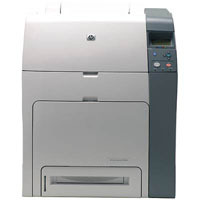 HP Color LaserJet CP4005dn can print at speeds of up 30 pages per minute for monochrome and 25 ppm for color. Printing photos is fast too – 10 seconds for 4×6 in. and 14 seconds for 8×10 in. picture on average. Text quality is good enough for almost any business documents. Graphics quality is pretty good for any internal business use, and such things such as trifold brochures and other handout materials.